In a landmark show at the National Gallery in spring 2018 – the first purely Monet exhibition to be staged in London for more than twenty years – there is a unique and surprising opportunity to discover the artist as we have never seen him before. We typically think of Claude Monet as a painter of landscape, of the sea, and in his later years, of gardens – but until now there has never been an exhibition considering his work in terms of architecture. Featuring more than seventy-five paintings by Monet, this innovative exhibition spans his long career from its beginnings in the mid-1860s to the public display of his Venice paintings in 1912. 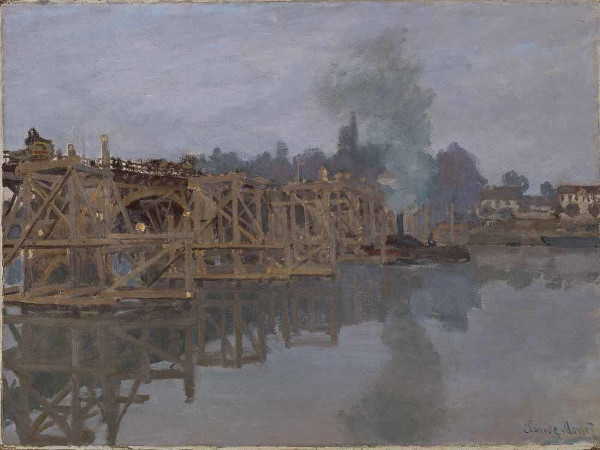 As a daring young artist, he exhibited in the Impressionist shows and displayed canvases of the bridges and buildings of Paris and its suburbs. Much later as an elderly man, he depicted the renowned architecture of Venice and London, reflecting them back to us through his exceptional vision. More than a quarter of the paintings in The Credit Suisse Exhibition: Monet & Architecture come from private collections around the world; works little-known and rarely exhibited. Buildings played substantial, diverse, and unexpected roles in Monet’s pictures. They serve as records of locations, identifying a village by its church (Église de Varengeville, effet matinal, 1882, Private Collection), or a city such as Venice (The Doge’s Palace, 1908, Brooklyn Museum), or London (Cleopatra’s Needle and Charing Cross Bridge, about 1899–1901, Private Collection) by its celebrated monuments. 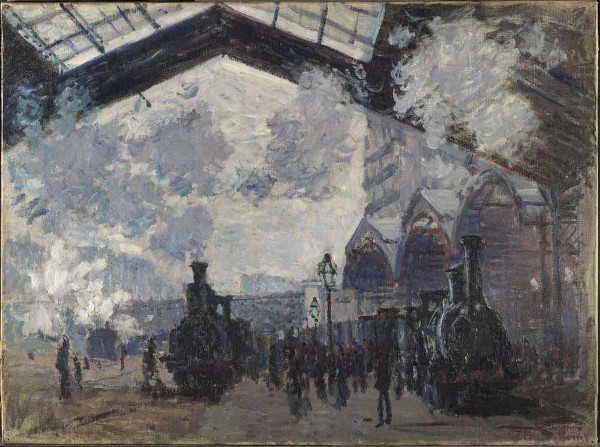 Architecture offered a measure of modernity – the glass-roofed interior of a railway station, like the Gare Saint-Lazare (1877, National Gallery, London) – whilst a venerable structure, such as La Lieutenance de Honfleur, (1864, Private Collection), marked out the historic or picturesque. Architecture aided Monet with the business of painting. A red-tiled roof could offer a complementary contrast to the dominant green of the surrounding vegetation (The Cliffs at Dieppe, 1882, Kunsthaus Zürich).The textured surfaces of buildings provided him with screens on which light plays, solid equivalents to reflections on water (Rouen Cathedral, 1893–4, Private Collection). Antibes, 1888, The Cleveland Museum of Art), are marks of scale, responding to our instinct to read our physical surroundings in terms of distance, destination, and the passage of time involved in transit. Architecture can stand in for absent human presence and suggest mood, whether it be awe at the grandeur of a historical monument (San Giorgio Maggiore, 1908, Private Collection), thrill at the vitality of a teeming city street (The Pont Neuf, 1871, Dallas Museum of Art), or loneliness at the solitude of the clifftop cottage (The Douanier’s Cottage, 1888, Fogg Art Museum, USA). Monet & Architecture will be displayed in three sections – The Village and the Picturesque, The City and the Modern, and The Monument and the Mysterious – and will explore how one of the world’s best-loved painters captured a rapidly changing society though his portrayal of buildings. The Syndics of the Fitzwilliam Museum, University of Cambridge. On Loan from a Private Collection. It will feature a rare gathering of some of Monet’s great ‘series’ paintings – five Dutch pictures from trips made in the early 1870s, 10 paintings of Argenteuil and the Parisian suburbs from the mid-1870s, seven Rouen Cathedrals from 1892–5, eight London paintings from 1899–1904, and nine Venice canvases from 1908. Monet & Architecture will feature exceptional pairings, such as both paintings of the church at Vétheuil, which Monet made immediately on arrival in the village in late 1878 (one Scottish National Gallery, the other Private Collection). One was shown at the 4th Impressionist exhibition in 1879, and the other at the 7th in 1882, but they have never been seen together. The National Gallery's well-known Thames below Westminster (1871) will be seen alongside a picture of the beach at Trouville (1870, Private Collection), made only months before with the same size canvas and a very similar composition. 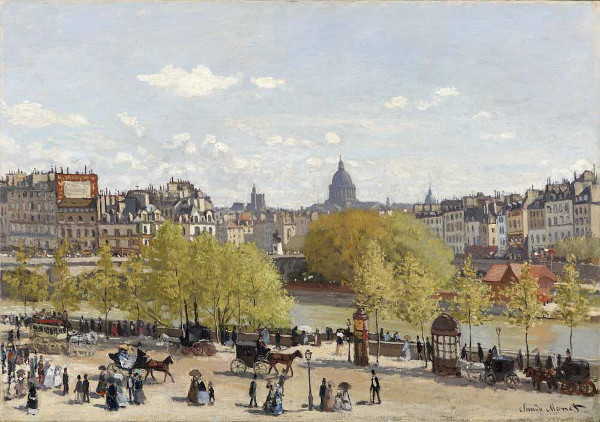 Many world-famous and much-loved Monet pictures will be travelling to London: the Quai du Louvre (1867, Gemeente Museum, Den Haag), one of his first cityscapes; the Boulevard des Capucines (1873, The Pushkin State Museum of Fine Arts, Moscow) shown at the first Impressionist exhibition in 1874 where it aroused controversy; and the flag-filled Rue Montorgeuil, 30 June 1878 (Musee d’Orsay) made to celebrate the celebration of a national holiday. For advance tickets to The Credit Suisse Exhibition: Monet & Architecture, please visit nationalgallery.org.uk or call 0800 912 6958 (booking fee). You can also book tickets in person from the Gallery. Overseas customers can contact us by dialling +44 020 7126 5573.